What green crops should be used for baby chick yards? In the fall, say about some time in October, early part preferred, spade up the yards and sow rye or wheat, preferably the former. This will get a fair start before the ground freezes, carrying over a growth of four to six inches of green through the winter. This is ready to come quickly in the first warm days of Spring. The baby chicks appreciate a chance to run over the green growth and will very soon make it look quite battered and torn. After it has been trampled and well eaten, as will be the case before the chicks have been on it many weeks, spade up the soil and plant oats. This usually can be done along in April, after the frost is out of the ground and the earth has warmed up a bit. The oats make a fairly rapid growth and will be furnishing a most excellent form of succulent food. It is a great sight to watch baby chicks running about in a yard in which the new oats are just popping into sight. The ground should be respaded and resown as often as conditions may require during the brooding season. This will depend much upon climatic conditions, the number of chicks in the yards, the quality of the seed oats, and the vitality of the chicks. One last word about the use of the baby chick yards is this : In the early part of the season do not turn the chicks out onto the runs until they have built up considerable vitality and strength. Turn them out first toward the middle of the day, and then only when the day is pleasant and mild. Get them accustomed to the outside yards gradually, but surely. If the soil is of a sticky nature, watch the chicks’ toes carefully, for they will often “ball up” and need to be cleaned off. If this is not done, sore toes and lameness result. 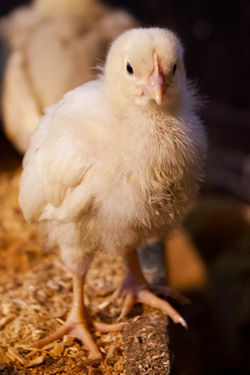 Make use of outside brooder runs early in the life of baby chicks. Should Chicks Have Outdoor Runs? What Kind of Chick Runs are Necessary?